The Houston Cougars pulled off their biggest win since beating Penn State in the 2012 Cotton Bowl. 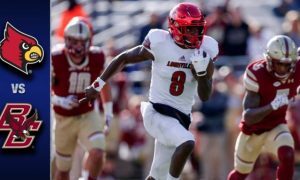 The Cougars defeated Louisville 34-31 behind a solid performance form quarterback Greg Ward Jr., who threw for 236 yards on 23 of 33 passing and three touchdowns. The junior also ran for 98 yards on 21 attempts. Two of Ward’s touchdown passes came in the fourth quarter, including his 15-yard game winning pass to Demarcus Ayers with 3:09 left in the game. Houston’s special teams also had a big game, blocking a 53-yard field goal attempt by John Wallace with 54 seconds left in the game. The game would have been tied and possibly would have gone to overtime if the field goal had been made. Cornerback Brandon Wilson also scored a touchdown on a 100-yard kickoff return for the Cougars in the third quarter. First year coach and former Ohio State offensive coordinator Tom Herman got his first signature win as the Houston head coach and looks to have the team turned around. Houston outgained Louisville 462-395 and recored four turnovers to give the Cardinal their second loss of the season. 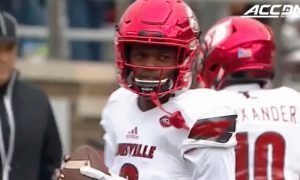 Louisville quarterback Lamar Jackson struggled in his first career start. The freshman completed 17 of 27 for 168 yards with one touchdown and two interceptions. He also ran for 16 yards and a touchdown. Louisville made a quarterback switch in the fourth quarter, when sophomore Kyle Bolin took his place. Bolin threw for 157 yards on 10 of 18 passing and one touchdown. 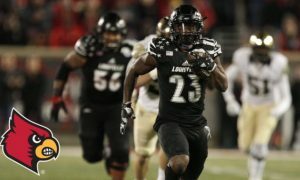 The Cardinals didn’t have much of a running game with Brandon Radcliff leading the team with 43 yards on 10 attempts, while Houston running back Kenneth Farrow looked dominant in his performance, rushing for 109 yards on 27 carries. Louisville will continue their tough start to the season when they host Clemson on Thursday, while Houston will be off next week.